More than 40 jazz festival & venue promoters around the world took part in a Jazzfuel survey about how they discover and book artists. 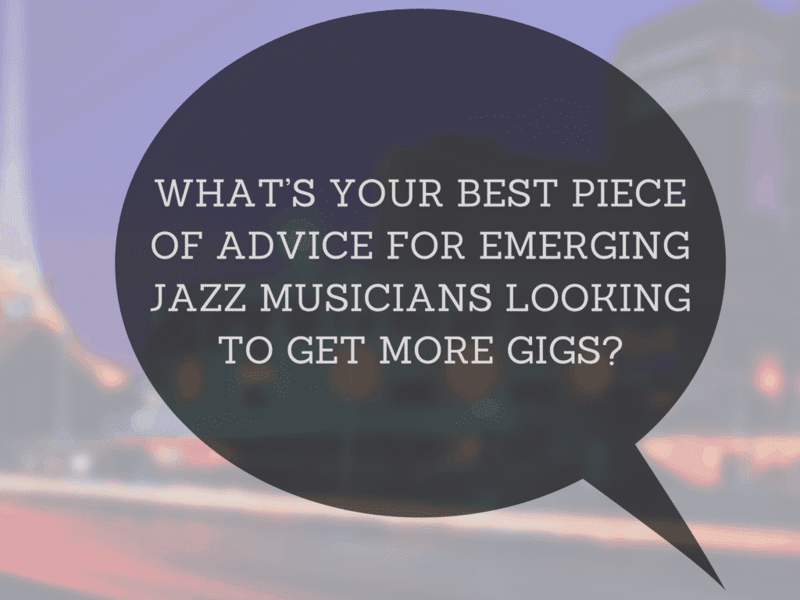 Here’s my round up of the answers and what they mean for you as a gigging musician. 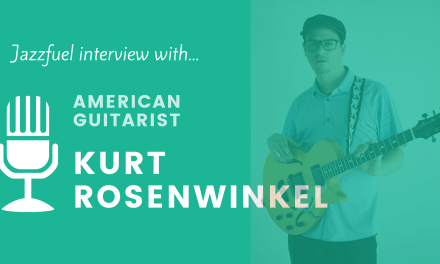 As an independent jazz musician, it’s not easy to know how to reach festival and club promoters and – when you do – to know exactly what they are looking for. As always, the best way to get some more insight into this is to ask the promoters themselves! Obviously 40-50 promoters doesn’t make up a huge proportion of the jazz festivals and clubs out there, and the UK is probably a little over-represented given my nationality! But the survey does include input from jazz bookers in Asia, US & Europe and the results are very representative of what I experience on a day-to-day basis and from the 1-to-1 interviews I’ve hosted on this site. If you’re reading this as a promoter and have another point of view to add, please feel free to post in the comments section at the bottom of this page. And for the musician readers, use these results to challenge where you are right now, but also look around your personal network for extra insight and tips. 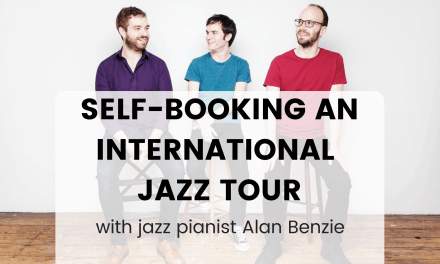 Where are promoters booking jazz gigs? Whilst there are loads of ways we could categorise the promoters taking part in this survey, the difference between festivals & clubs is probably the biggest. Almost half (47%) of promoters who took part in this survey are involved with booking bands for both a jazz festival and a venue. Promoters who only do jazz festival bookings make up the smallest group (19%) which is probably as expected, given that there are usually multiple venues per area but generally only one or two festivals (with the exception of the capital cities like New York, London, Chicago, Paris etc). A lot of promoters run both festivals AND venues. So, if you can’t get booked for the festival right away, a smaller club gig might be a feasible goal and a good way to try and show the promoter how well-received your performance is with his or her local audience. Alternatively, if you get booked at a festival and the show goes great, you should think about following up with a show in the venue 12-18 months later. It’s rare to get rebooked on a festival within 2-3 years of the last performance, but a club is a different matter. Approximately what percentage of artists you book DON’T have a booking agent? The #1 thing I hear from musicians who are struggling to book gigs for their project is that the solution would be to get a booking agent. I have my suspicions (hence the “How To Get More Jazz Gigs” course) but I wanted to know what the promoters’ experience of this was. Did they work exclusively with agencies, or were they happy to deal directly with musicians whose music and profile fitted with their festival or gig? You might be surprised, but on average, the promoters in this survey said they booked more than 50% of the artists at their venue or festival directly. NONE of them said they only worked with agents. 48% of promoters said that 2/3’s (or more) of their bookings were done directly with artists. Now obviously as an agent, I’m not trying to say that it’s not good to have representation. It’s a fact that if you have an agent who is connected in the jazz world, they can make sure that your music gets considered by promoters who might not otherwise check it in as much detail. But what this result hopefully does change is the belief that most festivals and venues are out of reach until you have an agent. So for sure keep in touch with possible agents and send them your news to get them interested. But put the majority of your efforts into actually reaching out directly to promoters. (But not all promoters. The promoters whose programmes you’ve checked so that you know they book the sort of music you’re making, at the sort of level you’re at). How are jazz promoters discovering new artists? For me as a booking agent – and you as an independent jazz musician – it helps to know how promoters are discovering new music. Because if you know that, you can try and improve the way you are represented in those areas. 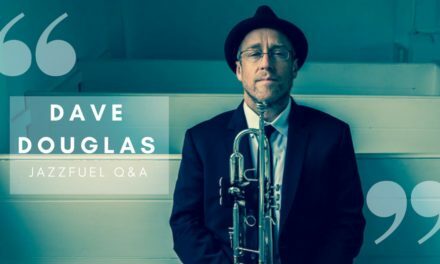 For this question, the promoters could choose as many of the answers as they wanted, to give the fullest possible overview of how they discover emerging jazz projects. Almost 80% of promoters said they put a lot of value on personal ‘industry’ recommendations. It makes sense: if you are bombarded with 100’s of emails and calls a week, on top of your own research, you need to have some outside references to speed up the process. Talking with journalists, agents, record labels and other promoters who you know personally (and whose artistic taste you trust) is very valuable. It’s a bit like you asking a friend with great taste in movies what to see at the cinema. It might not always result in something 100% to your taste, but it’s much more likely to be relevant than just reading reviews and watching trailers. In a similar vein, promoters also put a lot of trust in their own taste, with 72% of them saying they liked to discover bands live – either at festivals or showcases. 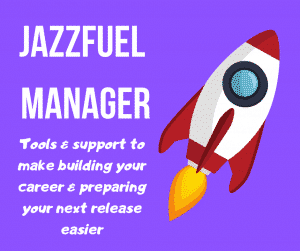 It also goes back to that very important point that we’ve heard many times in the Jazzfuel interview series about how crucial it is to perform brilliantly, as well as play brilliant. It’s a subtle difference, but one that becomes super clear when you see a band which captures an audiences’ attention from the start to the end of the show. Whilst 60% may seem low for the amount of promoters who regularly discover potential bookings via emails, it’s actually pretty encouraging: 3 out of every 5 emails you send are going to festivals and clubs who are completely open to being introduced to your music this way. As long as you have done your research and follow the advice at the end of this article! 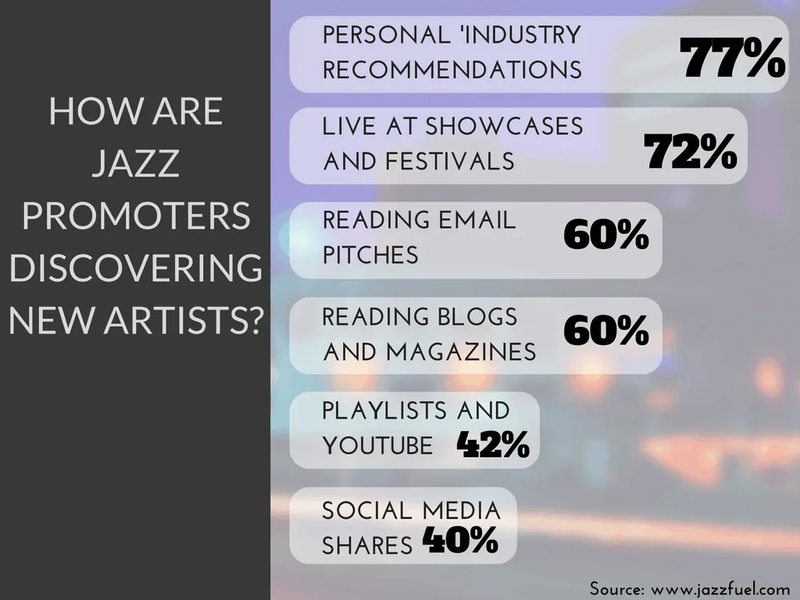 Similarly, 60% of promoters are regularly digesting magazines and blogs to find great jazz projects for their club or festival. If you are looking to get into a specific territory, engaging a publicist is a good way to ensure that they are seeing you in these places. Or, in your home country, you might already have enough contacts to do this yourself. Either way, putting in consistent effort on getting your name out there pays off in the long term. Whilst Youtube/Spotify (42%) and Social Media (40%) came in last on this list, there are still enough promoters checking these places to make it worth your while dedicating some time each week to taking care of these areas. Playing (and filming) great live shows so that industry people talk and journalists write about you. Then sharing this excitement via social media and in the emails you’re sending out. Just like that, all 6 boxes ticked! People within the industry are constantly talking and sharing ideas and news. The more people you are connected with, the more chance you have of getting your music heard. 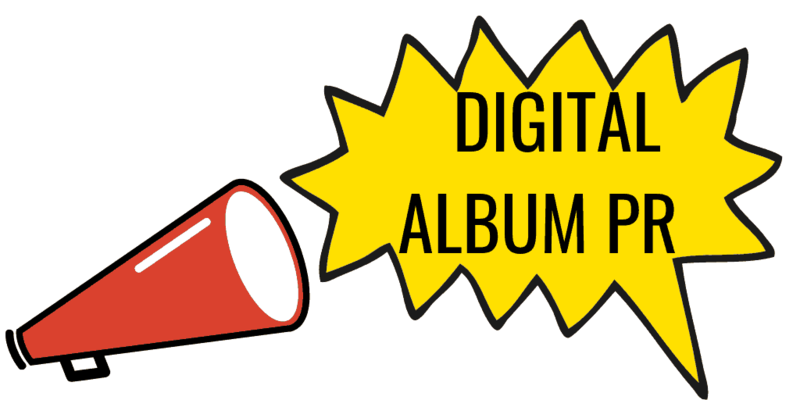 Where do jazz promoters go FIRST to check out a new jazz project? It’s not easy being a musician, right? Aside from actually practicing and performing (and possibly teaching), there’s a whole bunch of admin that needs taking care of to make progress with building your career and getting gigs. So I thought it would be good to know the FIRST places that promoters go when they hear about a new project, so you can make sure that you are nailing these at least. It’s also interesting that, despite the popularity of social media and Spotify for checking out music, an artist website is still the 2nd most popular place. 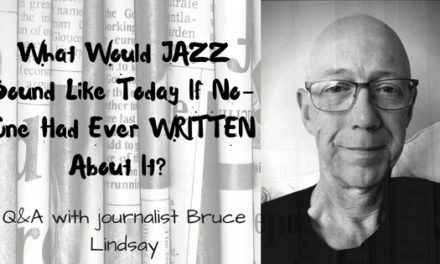 I’ve written in detail before about what makes a great jazz musician website but the key thing is this: make it a simple hub to all your best content. You can get a free checklist here too. If you’re happy with what shows up, congrats! Improving the SEO of your best videos so they show up higher in the search results. 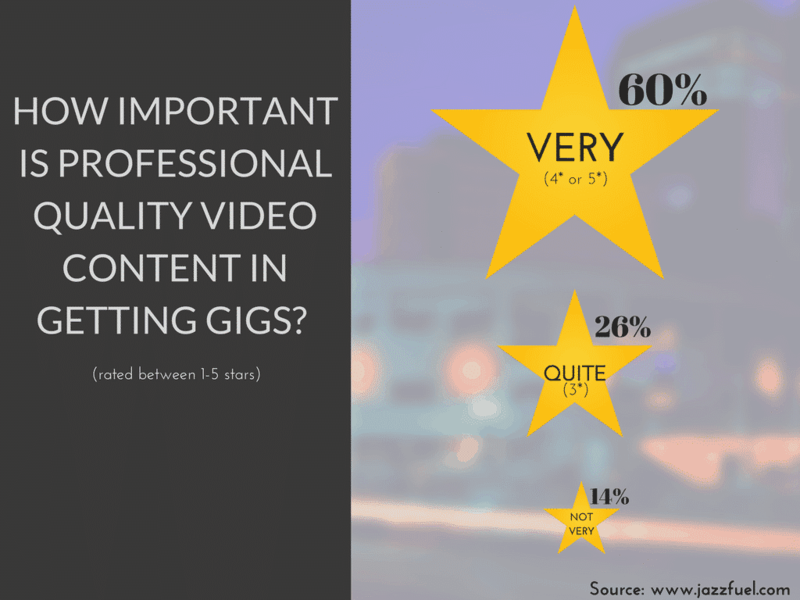 How important is PROFESSIONAL video content in getting gigs? I’ve got to be honest: I sort of expected the Youtube result to be top (or close to it) when I asked that last question. From personal experience as a booking agent, a great video has opened up so many great gigs to artists I work with. But, to be sure, I wanted to also see how important the promoters who took this survey felt the quality of these videos was when it came to booking bands. So, a very simple question: on a scale of 1 to 5, how important is the quality of the video to getting booked? 60% of jazz promoters in this survey said that a high quality video was very important (4 or 5 stars) for a musician or band who were trying to get more jazz gigs. The only surprise to me (and maybe you?) was that the number was not higher! Several of those who gave 3 stars noted that they also liked to see ‘live footage’ (regardless of quality) to get an authentic idea of how the band played live, but I think the result is emphatic enough that you should be in no doubt: in order to reach the largest possible number of promoters with your music, you need to have a professional quality video. Obviously there are exceptions to every rule but, as an agent, I can’t imagine taking on an artist who wasn’t able to give a good snapshot of their project via high quality video. It still amazes me when people reach out with videos shot on a shaky iPhone with distorted audio. It’s just too affordable and easy to do high quality video these days, that anything less just looks amateur. An easy one: if you don’t have professional quality footage of your project and you want to be getting gigs nationally and internationally, you need to make plans to sort it out! It doesn’t have to be expensive or complicated, but it does have to be done (and uploaded to Youtube). Also worth noting that new videos can generate almost as much attention as a single or album release used to, so it’s not just something to get done to send out to festivals. It can also be used pretty effectively to generate more news and buzz around your project. Big thanks to all the promoters who answered. I couldn’t fit all of them in here but below are a selection which nicely sum up the things we already looked at in this article. Big thanks to all the promoters who took time to read my email and to share their insight. I know only too well how many messages they are getting a day, so it’s no small thing that there was so much feedback for this survey. Some of them were answered anonymously, but from those I know, I wanted to shout out to them. Please check out their gigs, follow them on social media and take all of their advice on board before considering whether you should email them or not! Ronnie Scott’s, Spice of Life, Newcastle Festival of Jazz & Improvised Music, Jazz North East, Philippine International Jazz Festival, April Jazz Festival, Southport Jazz Festival, We Jazz, Cully Jazz Festival, Jazzlines, Lublin Jazz Festival, Umbria Jazz Festival, bee-flat im PROGR, Jazz Fola Aix, Ribble Valley Jazz & Blues Festival, Turner Sims Concert Hall, Cankarjev Dom, Ljubljana Jazz Festival, Fougou Music, Pancevo Jazz Festival, Jazz at the Lescar, Belgrade Jazz Festival. How to book gigs for your project more effectively. A look inside a European jazz booking agency. Booking agents & jazz manager: what each of these people do. NextPromoting your new album without a jazz publicist? Matt, thank you for writing this. It was super helpful. Thanks Greg, glad you enjoyed. Matt, well written – a great article. There’s nothing uncool about being business-like in jazz; the better we present & sell the music, the more it will take its rightful place alongside he rest of serious music. NYJO has recently been successful in getting gigs at Festivals – not jazz festivals, Festivals generally like Cheltenham and Petworth – we wouldn’t have got them without the sort of marketing that you are suggesting. So I would encourage your audience to spread the net wider & go beyond jazz festivals to bookers of good modern music ! Thanks Nigel – great to hear NYJO getting out and about to a bigger audience and 100% agreed on the positive results of being open to the results of business-like work. There are so many websites out there which are not related to jazz (or even music) that you can borrow ideas and techniques on marketing and advertising for your projects. One of your best so far! Thanks for this Matt!